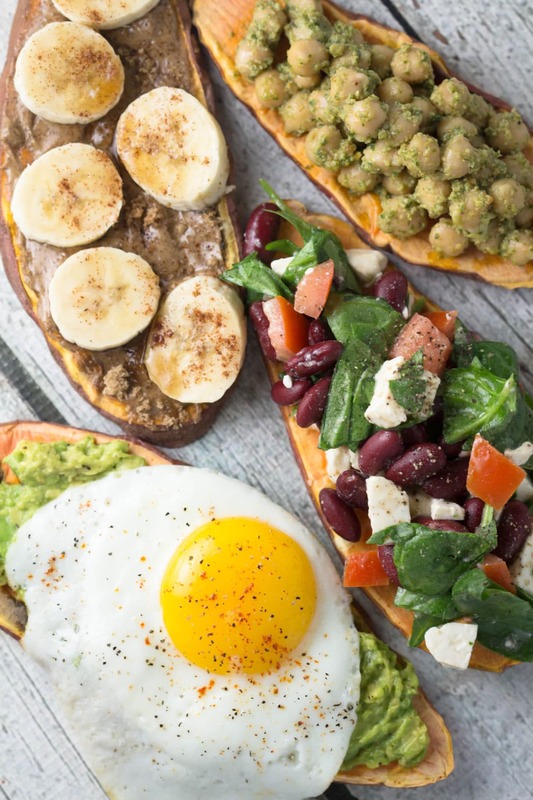 Sweet Potato Toast - 4 Ways! A new-ish trend: using slices of sweet potato instead of sliced bread. I’m game! These are just 4 ways to enjoy Sweet potato toast…the opportunities are endless! I guess I am a liiiiittle late to the sweet potato toast bandwagon. The girls in my condo at Blog Brulee mentioned it and I had no idea! 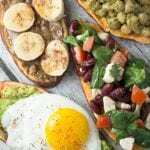 These “toasts” will give you a powerful nutritional punch! Loaded with vitamin A, potassium and fiber – it makes a nice alternative to regular toast. Don’t get me wrong though…regular toast will always come out on top (for me at least), but fun nutritional alternatives always make for a nice change in the kitchen and for your palette! Easy peasy and super kid friendly too! Sweet potato toasts are perfect for the AM or PM – you can’t really go wrong with it! I think it’s cool that you can cook the sweet potato right in the toaster too! In a matter of minutes you have bites of heaven ready to enjoy! What are some toppings you have tried or think would go well on sweet potato toast? 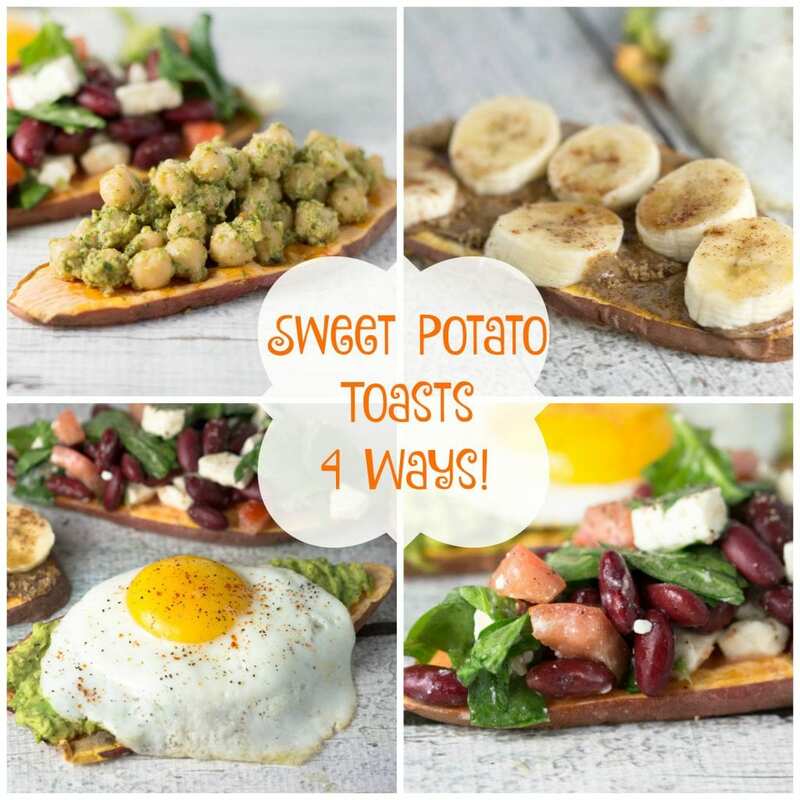 Sweet Potato Toasts - 4 Ways! These Sweet Potato Toasts are an easy, healthy & fun way to enjoy breakfast or brunch! Preheat the oven to 400ºF and spray a baking sheet with PAM to help prevent sticking. Arrange the sliced sweet potato in a single layer on the baking sheet - no oil necessary! Bake until the slices are tender and easily pierced with a fork, about 20 minutes. Then place in toaster to get a little more toasty! Kidney bean salad (kidney beans mixed with chopped spinach, feta cheese, diced tomatoes, tossed in Italian dressing and seasoned with pepper). Okay I’ve never heard of this either! Brilliant!